sassyfrazz: I would love to win this! I would LOVE to win this prize pack from Cool Mom's Rule blog! 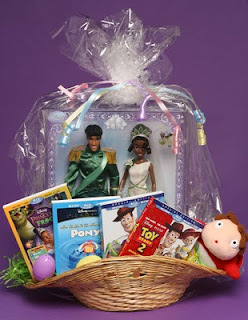 Blu-ray & DVD Combo Packs for the exciting new releases of Ponyo, The Princess and the Frog, Toy Story and Toy Story 2 Special Editions, a Princess Tiana and Prince Naveen wedding doll set, plush Ponyo--all in an Easter basket and even add some assorted holiday chocolates and Easter eggs!! I am still up in the air about the new princess movie. I need to rent it. Cindy said it was very in your face with voodoo.